AK Imagery Blog: A Day in L.A. This week's potw has a little story. The last time Dan was down here from Waterloo (about 3 weeks ago) we thought we should drive down to L.A. the next time he came, to relive our El Cholo experience from Siggraph 2001. So on Saturday morning, we left San Jose at 8 AM. We stopped at the Montecito Cafe (a favourite dining spot in Santa Barbara for Kim and myself) for lunch and managed to make it to Santa Monica by about 3. 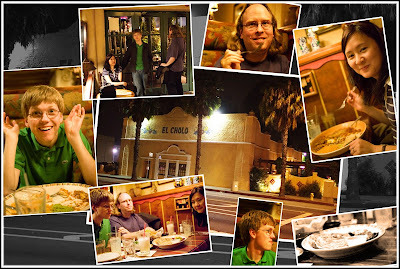 After some shopping we went to the Santa Monica El Cholo location for dinner. Then at about 8 PM we started our long drive home to arrive back in SJ at 2 AM. It was a long trip, but worth it. El Cholo was all I remembered it being (arguably even better), and I would highly recommend you stop by there if you are in L.A. or Santa Monica.